This study aims to understand how Mesolithic stone technology could have been used to produce the Holmegaard bow and the effectiveness of different types of stone technology in each stage of the production of the bow. In 1944 a set of two flat bows from the Mesolithic period were found in the Holmegaard Mose (Holmegaard Bog) on the Danish island of Zealand (Figure 1). One bow was complete and the other only about half complete; they are some of the oldest bows in existence. The bows are characterised by their distinctive design with broad tapering limbs and a cut away handle (Hardy, 2006). Both bows are now housed in the National Museum of Denmark, Copenhagen and have been dated to around 7000BC (National Museum of Denmark, no date). Despite the rarity of this type of artefact, very little research has been done into the use and effectiveness of stone technology into the production of prehistoric bows let alone the Holmegaard bows. 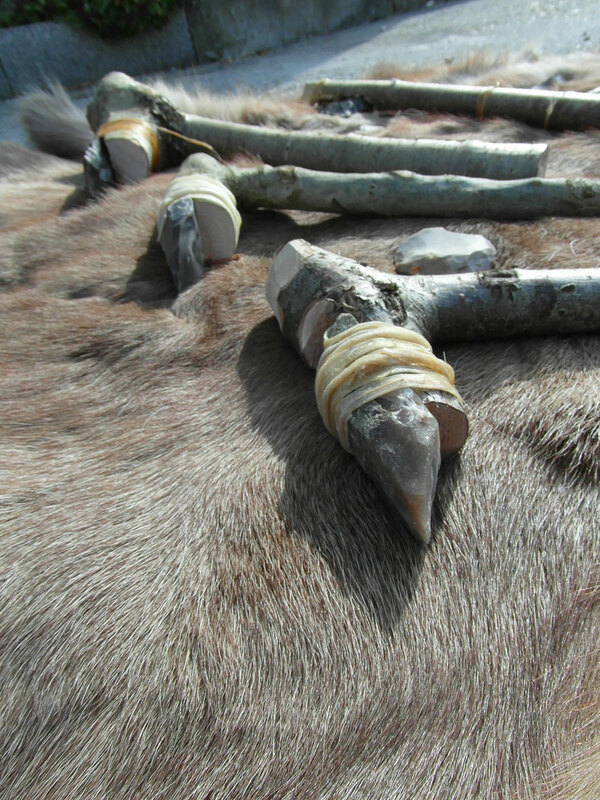 This study presents the results of an experiment to produce a replica of one of the Holmegaard bows using only the tools and techniques available to our Mesolithic ancestors. The 1970s saw the beginnings of the boom of research into prehistoric woodworking. This was focused around discoveries such as flag fen in 1982 (Vivacity, 2011) and multiple finds on the Somerset levels including the Sweet Track in 1970 (Burnham, 2007) and Glastonbury lake village in 1892 (Glastonbury Antiquarian Society, 2013). This research focused on house building techniques or generic prehistoric wood working tools and techniques, such as felling, splitting and finishing. However, it is all very well saying how each tool was used and what it could have been used for, but it is how these techniques are put into practice to create a useful and functional object which is most significant. It is not until these tools are applied in this way that we can truly understand how they were used. 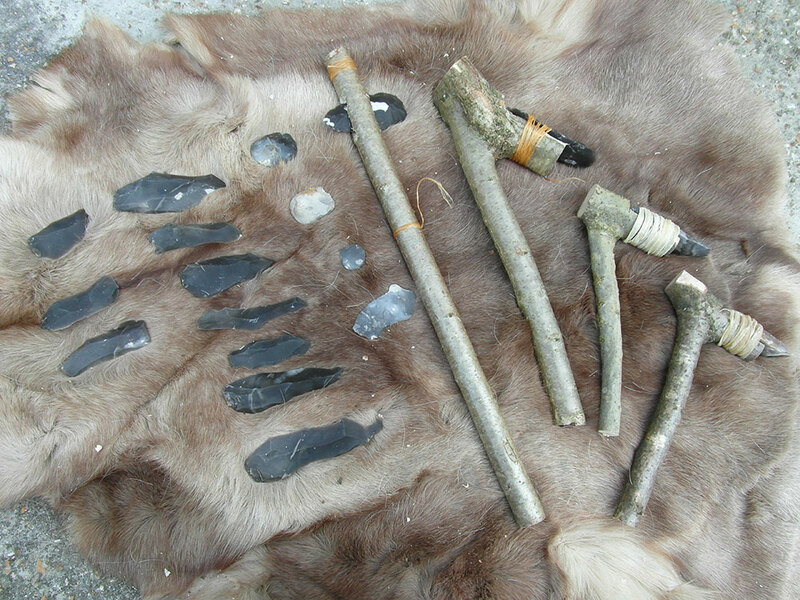 Figure 4: The Stone Tools used to produce the replica of the Holmegaard Bow. Left to Right; Blades, Scrapers, Axe, Adze’s. All of the research on the sites stated above was primarily concerned with woodworking with stone tools during the Neolithic period or later. Although this isn’t the time period dealt with in this study, the research and reports on sites like these, such as ‘Ancient wood, woodworking and wooden houses’ (Coles, 2006), ‘Britain BC’ (Prior, 2004) and ‘Man the Tool-Maker’ (Oakley, 1972), provides a basis on which to build upon our knowledge and deepen our understanding into this aspect of our stone age past. Although most research into prehistoric woodworking has been concerned with generic woodworking techniques, some studies have looked into the production of prehistoric bows. Most of these experiments have been undertaken by enthusiastic amateurs with little archaeological basis for the tools they’re using. Often a ‘mix-match’ of tools from a multitude of periods are used and their experiments aren’t recorded accurately, if at all. However, the experimental work that has been done by professionals is very high quality and this study aims to build on their work. The most significant of these works is the experiment into reconstructing the Ashcott Heath bow using only stone tools by Christopher Boyton and Ray Mears (Mears, 2005), ‘Neolithic Bows from Somerset, England, and the Prehistory of Archery in North-western Europe’ (Clarke, 1963) and ‘The skill of the Neolithic bowyers –reassessing the past through experimental archaeology’ (Prior, 2000). Mesolithic woodworking techniques are an interesting but under researched subject. This original study aims to shed a light on woodworking techniques of this period in the context of the production of the Holmegaard bow. Using tools and techniques of the Mesolithic will provide a useful comparison to those studies undertaken around later prehistoric periods. The Holmegaard bow has received little attention from the archaeological community in the past despite being one of the earliest bows in existence. Research into this artefact will provide us not only with new information about the Holmegaard bows but with a new analysis of prehistoric woodworking techniques. It is difficult to pinpoint exactly when or where the bow was first developed. We have only a handful of bows most of which are from Northern Europe. This is likely to be related to the presence of stable peat bogs rather than the bow having been invented there. The anaerobic conditions that the peat bogs create mean that organic material is more likely to survive than in other environments therefore more bows have been excavated here. The huge climatic changes which occurred at the end of the last ice age, which raised sea levels, moved deserts, ice sheets and peat bogs, significantly limits how far back we are ever likely to find a bow (Prehistoric Archery and Atlatl Society, 2013). We have thousands of microliths and so called ‘arrowheads’, the oldest of these dating back around 50,000 years, found in the Tunisian Sahara. The earliest of these points are too large to have been arrowheads, and were probably from Atlatl darts. Later stone points from Spain dating to 19,900BC are of suitable size and shape for arrowheads; however, it is difficult to determine whether these came from a spear, arrow or other tool. Not all arrows would have had had stone arrowheads as some would have had wooden points (Prehistoric Archery and Atlatl Society, 2013). Unlike the spear, which required the hunter to move right next to the animal they were stalking in order to kill it, the bow gave hunters a select advantage over their prey as it enabled them to kill their quarry at a distance. This decreased the chance that the animal would see or hear them and therefore being able to escape. Also, for certain types of large game, it reduced the risk of injury and even death as there was the inherent danger of being trampled or kicked to death by the very animal you were trying to catch. 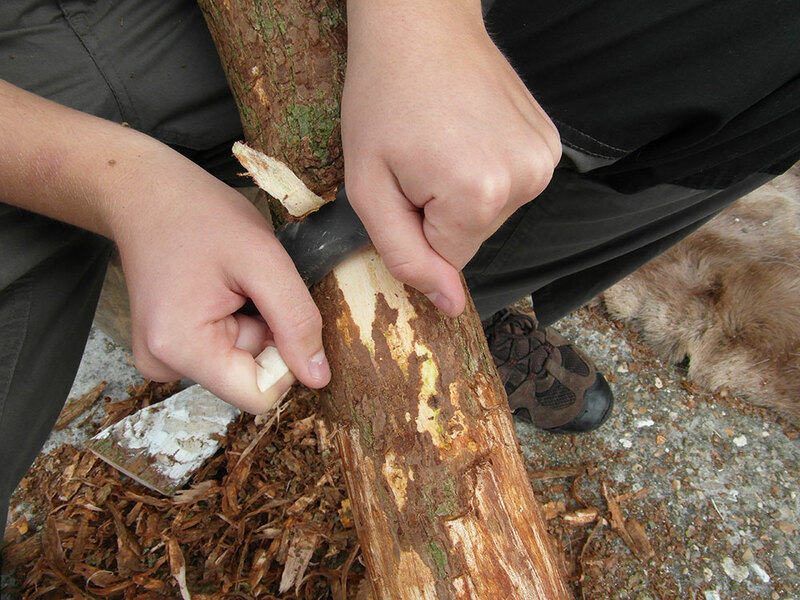 Figure 5: Removing the outer bark of the bow stave using a flint blade which is held like a drawknife. Figure 6: Roughing out the bow using the flint adze. Figure 7: The handle of the bow stave prior to splitting. Note the two deep notches cut either side of the handle to prevent the split running the entire length of the bow and removing wood from the raised handle section. The Holmegaard bows are self-bows of a very sophisticated flat bow design. They are characterised by their broad limbs, which taper almost to a point and show no evidence of string nocks. The bows are hewn from a single piece of Elm, probably grown in the shade of another tree due to narrowness of year rings (Hardy, 2006). The belly of the bows are flat and the backs are crowned, (Prehistoric Archery and Atlatl Society, 2013) caused by the outer growth ring of the sapwood forming the back of the bow (Boyton, 2013c). This gives the limbs of the bow a shallow D section (Hardy, 2006, p.17). Therefore, the steep curvature of the back of the bow suggests that the bow was made from a tree of a small diameter. This would have meant for our Mesolithic ancestors that there was less wood to remove minimalizing the energy required to make the bow. The grip is well defined and square in section (Clark, 1963). It is cut away allowing for an almost centre shot passage of the arrow (Hardy, 2006), improving its accuracy. There is an increased thickness in the centre of the bow for the grip which causes a slight stiffness in the centre, when the bow is drawn. NB: The Holmegaard bows do not have an exaggerated step in their limbs unlike the Mollegabet bow which is wrongly called a Holmegaard (Prehistoric Archery and Atlatl Society, 2013). Some enthusiasts have argued that there is a slight step in the limb of one of the Holmegaard bows however this is likely to be due to the wood shrinking after spending nearly 10,000 years in the ground. It is important to highlight that both bows found at Holmegaard are made for fully grown men. The only person of this period, from Denmark, whose stature can be calculated is the woman found at Koelbjerg, near Odense. She was approximately 155cm tall and died around 8000BC aged 25 at most (Archaeological Institute of America, 1997; Clark, 1963). However recent experts have suggested the mean height for Mesolithic males to be around 166cm tall with an estimated body mass of 62kg (Hermanussen, 2003). Therefore it is possible that some people would have been able to reach a height of around 180cm tall. Both ethnographic and archaeological approaches were employed to decide which tools could have been used by the bowyer who made the original Holmegaard bows. Determining the tools that could have been used to make the bow was very difficult because a perfectly preserved Mesolithic bowyer’s toolkit doesn’t exist. Even analysing the micro wear marks on the bow, if still present and undamaged, will not give us the full picture because marks made by tools or techniques used early on in the bow production process are removed by tools and techniques used during the tillering or finishing processes. A comparison of the tools that Mesolithic people would have had access to with those of a modern bowyer enables us to determine the sorts of tools the original bowyer would have used. The key development of the Mesolithic was the dramatic change in the stone tool culture which in many ways defined the period. This period moved away from the large bifacial core tools of the Palaeolithic, such as hand axes and spearheads, to the production of long blades from specially prepared cores. Stone blades were hugely versatile tools; they could be fashioned into a handle as a knife, hafted into a shaft to create a spear or arrow point and re-worked to create an awl or scraper. These were the real revelation of the Mesolithic period and characterise the transition from the old into the middle stone age. As well as using stone blades our Mesolithic ancestors also had access to core tools such as the tranchet adze and axe. These were versatile tools in their own right and would have been used in all manner of wood working practices. In keeping with the original artefact, a stave of Wych elm, Ulmus Glabra, was used to create the replica of the Holmegaard bow. The tree was about 5 inches in diameter and was felled using a modern steel axe. If a different wood had been used, the properties of the material may have been different obscuring the results of the research. 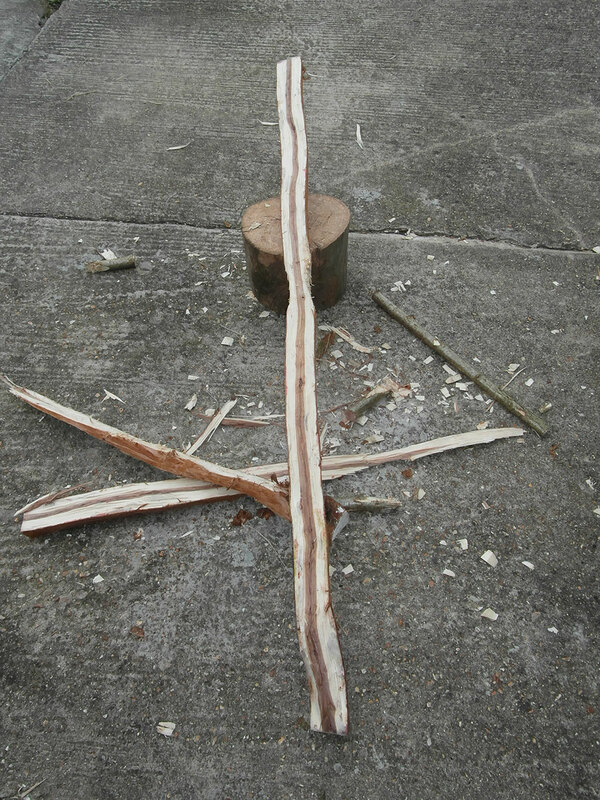 Figure 8: One of the bow limbs being split using hazel splitting wedges. Figure 9: The bow stave after excess wood has been split from both limbs. Figure 10: Removing wood from the belly of the bow, using a flint blade, for the tillering process. The original bowyer who made the Holmegaard bow would have worked the stave as soon as the tree was felled, as it was easier to work with stone tools. However, due to time constraints on the project this was not possible. In order to stop the wood drying out and to keep moisture content of the wood similar to that of when it was felled the bark was left on and the ends of the logs were painted (Boyton, 2013c). This acted as a barrier to water and kept in the moisture which prevented the wood from drying out. Before work begun, the ends of the bow stave were sawn square. In order to remove the bark on the bow stave, both flint blades (Figure 5) and scrapers were used. Working the wood unseasoned or un-dried allowed for easy bark removal, something that would have been more difficult had the wood been dried (Boyton, 2013c). The outer bark was removed first to reveal the inner bark, beneath. This layer readily peeled away from the wood beneath and contained a series of small pits however these didn’t compromise the outer layers of wood underneath. The inner bark was not removed immediately as it protected the outer growth rings of wood underneath, which would eventually form the back of the bow. If these had been damaged the wood would need to be meticulously scraped back to reveal the layer underneath, if not the finished bow may have snapped. The first step in the roughing out process was to decide which side of the stave would form the belly and the back of the bow. This was a critical decision in the bow making process because if there were any areas of weakness in the bow stave e.g. knots or pins it could lead to the bow breaking (Mears, 2005). Next the position of the handle needed to be marked on the stave because the Holmegaard bows have an increased thickness in the centre of the bow for the grip therefore it was important that this wood wasn’t removed. Secondly the back of the bow stave needed to be worked so that it was of a suitable thickness to begin shaping the bow limbs. This was done by bracing the stave on a wooden chopping block and using both the adze (Figure 6) and axe to remove layers of wood. The chopping block was used so not to damage the stave whilst it was being worked and so the stone tools weren’t damaged if they missed the stave, hitting the chopping block instead of breaking, hitting the floor. At this early stage it would have been much easier to split the wood from the stave however it wasn’t clear if the grain of the wood was twisted. If the grain was twisted and the excess wood was split off it could have rendered the stave useless. Our ancestors were deeply in tune with their environment and would have known whether the grain in the wood was twisted or not. Therefore they would have split the excess wood from the stave as soon as the tree was felled (Boyton, 2013c) as this saved them time and valuable energy. After working down the back of the bow it became clear the grain of the wood was not twisted, therefore the decision was made to split the excess wood from the stave to speed up the roughing out process. In order for this to take place the handle of the bow needed to be carved out (Figure 7), using the adze, to ensure that when the stave was split it didn’t reduce the thickness of the centre of the bow, by preventing the split traveling all the way through the bow (Boyton, 2013c). This meant that two splits would have to be induced into the stave, one for each limb, starting from the end of the limb and running in to the centre of the bow. 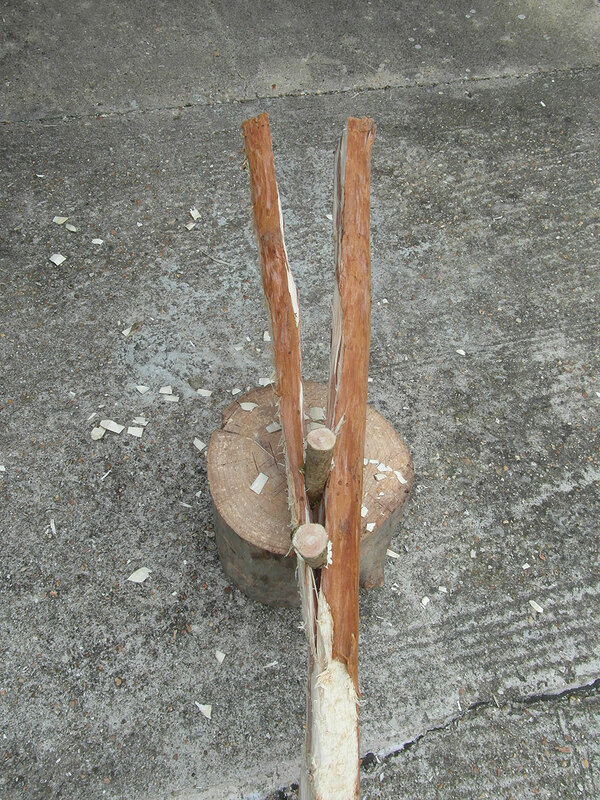 Beginning the initial split into the end of each limb was very difficult and one of the adze’ broke trying to do this. This was eventually achieved by carving a narrow groove the end of the wood using the axe and hammering in a flint blade to begin the split. Wedges made from hazel were then used to widen the split and direct it along the limb (Figure 8), using a wooden mallet to tap them in. This process was repeated for both limbs. Any further reduction of the limbs that needed to be done was done so with the adze. Once the limbs of the bow had been reduced in their thickness sufficiently they needed to be shaped. This involved carving them so they were broad at the handle, tapering almost to a point at the ends of the limbs. The shape of each limb was marked on the stave out using a piece of string and charcoal. This required two people, one to hold the string in place and the other to mark along the path of the string for the limb taper. The taper of the limbs was carved out using the adze and the axe. In order for the tillering process to begin the inner bark was removed as the final stage in the roughing out process using a flint blade. Figure 12: The finished Holmegaard Bow replica. Figure 11: Things didn’t always go according to plan! The flint adze head that broke whilst trying to split one of the limbs. Tillering is one of the final processes in bow production. It is a method by which one can check the tiller of the bow, the evenness of the distribution of the load when the bow is draw. If one area of the bow is weak or stiff, the load isn’t evenly distributed and tends to lead to the bow breaking. The process involves drawing the bow to gradually increasing distances in order to see how the load is distributed in the bow. This is repeated until the bow becomes fully drawn and the load of the bow is evenly distributed. This process required 2 people one to hold and draw the bow the other to check the tiller. The weak or stiff areas of the bow are marked on using a piece of charcoal and the process done entirely by eye as it still is today by modern bowyers. If there are areas which are stiff, wood is removed, if there is an area which is weak it is left alone the surrounding wood is removed. This was done by sitting on the chopping block, with legs outstretched, gripping the bow with the feet and using a flint blade like a drawknife to remove areas of wood (Figure 10). All the finishing techniques applied to the bow are designed to give the bow a good aesthetic feel and to preserve the wood. There are a variety of ways in which our ancestors could have done this all of those listed below were tried on the bow, each with differing results. Initially, to remove splinters stone blades were pulled up and down the bow like cabinet scrapers, used by modern bowyers. For this either the blades edge or facets on the dorsal surface of the blade could have been used. Stone scrapers were also used for the same effect. To give the bow a smooth feel and prevent it giving the hunter splinters an early form of sandpaper could have been used. This was made by putting sand from into a wad of leather and rubbing it on the bow. There is no archaeological basis for this however the materials and technology were easily available to our ancestors and it would have been well within their capabilities. 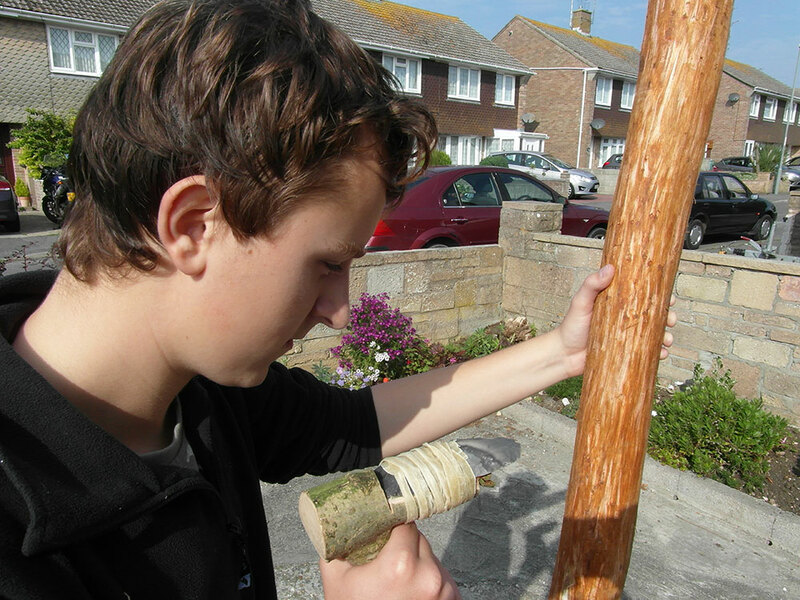 Rubbing the bow on a rock has a similar effect to that of sandpaper or other abrasive (Boyton, 2013c) and smooth’s the bow and removes splinters. Similarly there is no archaeological basis for this in terms of rubbing wood on rock however this process had been used to polish and abrade other objects. The technology was easily available to our ancestors and it more than likely they did something like this. In order to preserve the wood animal fat or pine resin could have been rubbed into the wood (Boyton, 2013c). On this replica animal fat was rubbed into the wood which sealed the wood and waterproofed it. This was done by applying the animal fat to a piece of leather which was then rubbed into the bow. The flint blades were far superior to the scrapers in removing the outer bark of the stave. They removed larges strips of bark very quickly whereas the scrapers only removed small fragments. However, one of the problems with the blades was that they could easily slip and cut hands of the user. Therefore it is likely these were held in a wad of leather or the ends were blunted. It was much easier to control how much the scrapers removed in comparison to the flint blades, which sometimes cut too deep, although this was only possible because the scrapers removed small amounts of material. Therefore, it is possible to presume that scrapers were used very little, if at all, as they were largely ineffective. This is confirmed by study on a sample scrapers found at Star Carr in north Yorkshire (c. 9500BC). 36 scrapers which showed traces of use were examined for patterns of wear; only 13% of these were found to have been directed on wood (Mithen, 1997). The axe and the adze are tools ideally suited to the roughing out stage of the bow. The whole bow could have easily been made only using the adze or axe (Boyton, 2013c). The flint axe was effective at removing material very quickly from the bow stave during the roughing out process. It was similar to its modern counterpart in terms of effectiveness and performance. However, it left a very rough finish on the wood which needed to be removed. While the adze removed less material than the axe it was much easier to control the angle and direction of the blows because the axe needed to be held further down the handle decreasing the accuracy of the tool. One of the problems found with all the hafted tools is that their bindings regularly came loose and sometimes the tools fell out of their hafting’s altogether. This meant that they required regular attention in order to ensure the bindings remained tight so that the tools performed effectively. This slowed the production process but if they were paid attention to it wasn’t really an issue. Inducing the split in the end of the stave to thin the limbs was very difficult and one of the flint adzes broke attempting to do this (Figure 11). This highlighted that the cutting edges of the core tools were fragile and needed to be careful not to put to tools under too much stress. The split was eventually achieved by cutting a small groove with the axe then hammering in a flint blade to begin the split. This achieved an excellent split. The flint blade performed almost exactly like a modern splitting wedge and also demonstrates the versatility of the tool. The study enabled me compare the effectiveness of both chert and flint stone tools on the production of the bow. The chert adze gave a cleaner cut compared to the flint adze which left a slightly rougher finish. The chert adze could also remove more material quickly. This was probably because the flint adze, although sharper, had a more brittle cutting edge whereas the chert adze, which was blunter, had an edge which was more durable therefore there were fewer tendencies for it to cut into the wood. Instead it created small splits along the grain of the wood enabling it to remove larger amounts of material. Therefore the chert adze needed to be sharpened less regularly than its flint counterpart. In terms of their performance and use the flint blades used for the tillering process were the most similar to using modern tools. The razor sharp edge of the flint easily cut into and removed wood from the limbs of the bow with ease. However, on the widest parts of the limbs, nearest the handle, it was difficult to remove large amounts of material at once because the cutting edge of the blades wasn’t perfectly straight. This meant that it was difficult to cut into the full width of the limb at once. 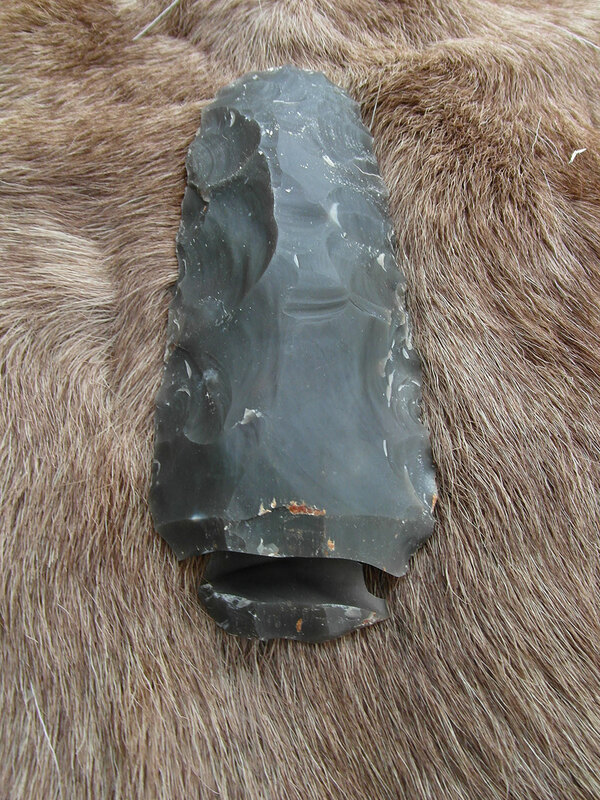 It is well documented, through the archaeological record, that the people of the Mesolithic were very skilled hunters, flint knappers, builders, wood workers and survivalists. 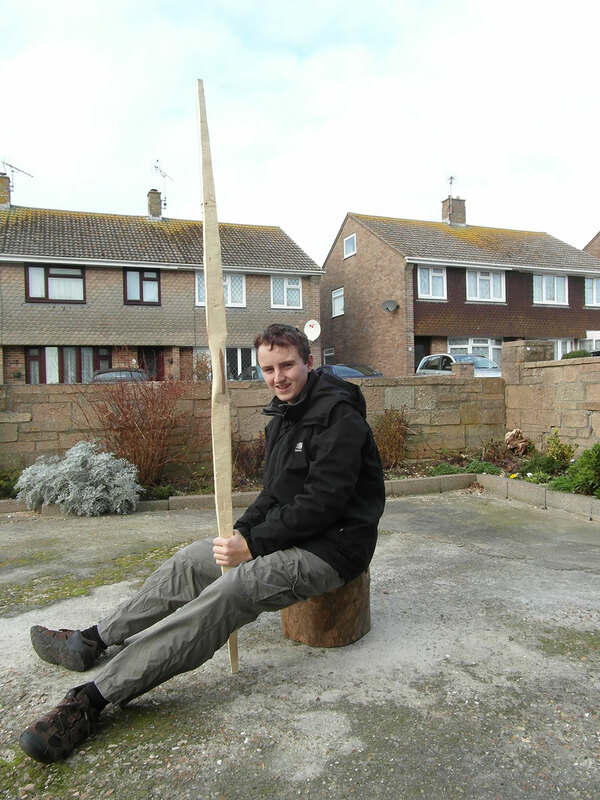 What this study has shown is that our Mesolithic ancestors were also accomplished bowyers as well. They understood the biomechanics of wood and the ways in which their stone tools could be applied to harness this to create a tool that would better their chances of survival. The toolkit that was used by the bowyer who made the original Holmegaard bow would have contained a small selection of versatile stone tools. These would, most likely, have been: the tranchet axe, tranchet adze, blades and sand. They would have been used in a variety of ways for each part of the bow’s production process. In order to remove the bark of the wood it was likely that the flint blades were used like drawknives; as this would have made the process very quick and easy. To rough out the initial shape of the bow the stave would have been split using a combination of the axe and a flint blade to begin the split. 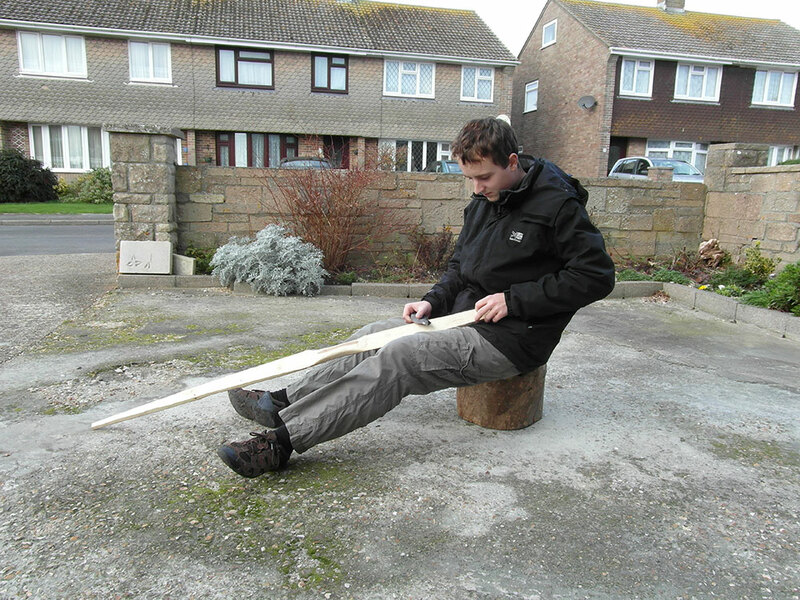 The rough out would be finished using a combination of adze and axe to shape the limbs and handle. The tillering process would have been done entirely using the flint blades either held in a wad of leather, their ends blunted or hafted in a handle and held like a drawknife. This would have given the original bowyer great control over the amount of wood they wanted to remove. The bow would have been finished off by initially rubbing the bow on a stone or rock to remove any splinters of wood and remove any nicks and tool marks. After this the bow would have been sanded, holding sand in a wad of leather to be used like abrasive paper, and then the bow would have been finished using the facets on the dorsal surface of a flint blade to smoothen the bow. The tools used to produce the Holmegaard bow were highly effective. Although they serve no replacement for modern metal tools, in some instances they came very close. The versatility of the tools available to our ancestors was at times astounding; particularly the flint blades which served as drawknives, cabinet scrapers and splitting wedges. The tools removed large amounts of material quickly and gave the bowyer both control over the amount of wood they wanted to remove and the direction of the cuts. For our Mesolithic ancestors, the effectiveness of the stone tools used by the bowyer who made original Holmegaard bow couldn’t be measured by how much wood they removed or how easy they were to use, ultimately it came down to the effectiveness of the bow itself. It wasn’t something made for recreation: it represented the survival of an entire people. It was the tool that put food on the table and ensured the longevity of our Mesolithic ancestor’s survival. Kevin Mathews – My EPQ Supervisor, for all his enthusiasm and advice in helping to produce this report. 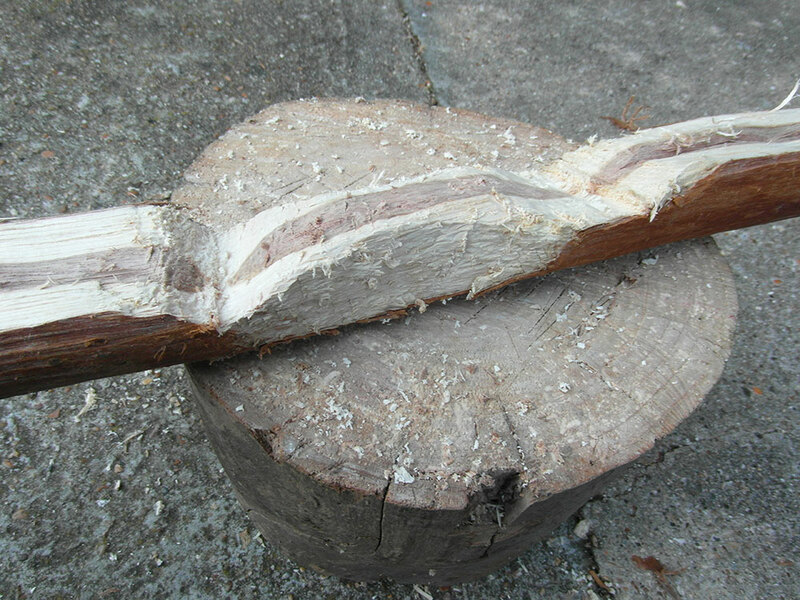 Ross Mangles – A good friend, for providing me with the Elm used to make the bow and his hard graft in cutting it down. John Lord – One of the best flint knappers in the country, for his advice and knowledge regarding Mesolithic stone tools as well as knapping most of the tools used to make the bow. His support and encouragement of this research project has been amazing. Karl Lee – One of the best flint knappers in the country, for knapping tools used in making the bow and his encouragement of my interest in archaeology. He has inspired my journey into archaeology and my interest in stone tools. Chris Boyton – The country’s top bowyer, for his help, advice and knowledge on prehistoric bowyery and his support of this project. Every piece of knowledge he has is like a little speck of gold dust! My Family – For their support of my project and putting up with endless quantities of prehistoric mess! Boyton, C. (2013a) Email to Jake Rowland, 28 August. Boyton, C. (2013b) Email to Jake Rowland, 29 August. Boyton, C. (2013c) Telephone conversation with Jake Rowland, 30 August. Clark, J. (1963) ‘Neolithic Bows from Somerset, England, and the Prehistory of Archery in North-western Europe’, Proceedings of the Prehistoric Society, Volume 29, December, pp. 50-98. Lord, J. (2013a) Email to Jake Rowland, 27 August. Lord, J. (2013b) Email to Jake Rowland, 4 September.